Jordanian-born attorney Munif, former editor of the Baghdad-based monthly Oil and Development , brings his epic Cities of Salt trilogy full circle in its closing volume. Cities of Salt and The Trench , set in the Sultanate of Mooran (a thinly disguised version of Saudi Arabia) from the mid-1930s to the late 1950s, traced the effects of the discovery of oil by American and British groups. Variations covers the prelude to that period in the early decades of this century, showing how the Sultan Khureybit consolidated his power and created Mooran as a modern nation-state. By moving his chronology backwards, Munif instills the action with multiple levels of irony. His detailed picture of life in the palace, where the sultan's many wives vie for primacy, makes a vivid contrast with the common people's simple piety in Cities of Salt ; he also reveals the roots of the rivalry between two of Khureybit's sons, profligate Khazael and quietly intelligent Fanar, who will later fight for the sultanate. One of the most vividly realized protagonists is the British adventurer Hamilton, a fascinating combination of T. E. Lawrence and what might be a character out of Edward Said's Orientalism . The densely aphoristic prose and folkloric tone are for the third time superbly translated by Theroux. 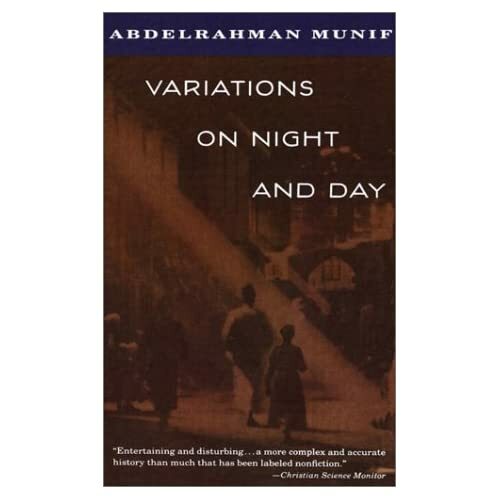 Munif is one of the most important writers to emerge from the Middle East in the last 20 years, and Variations on Night and Day triumphantly concludes his three-volume rumination on the poignancy of inevitable change, the sadness of those overwhelmed by the tides of history and the effect of those tides on the men and women who are carried by them. Copyright 1993 Reed Business Information, Inc. --This text refers to the Hardcover edition. The final installment of Munif's Cities of Salt trilogy, first published in 1989, offers still another view of the same historical subject: the corruption of traditional Arab values when Western allegiances substitute power and money for family and tribal loyalties. Munif's hero this time is Sultan Khureybit of Mooran, whose 1930's friendship with the British surveyor Hamilton makes him the natural instrument of London's notion that a single strong sheikh in the area will be easier to deal with than the usual endless wrangle. Accordingly, Khureybit looks beyond the normal means of consolidating his power--alliances with other chieftains and wholesale marriages with their daughters--and begins to attack his neighbors with quiet backing from abroad. With the flight of Ibn Madi, sultan of Awali, Khureybit's dominion seems secure. But his alliances force him closer to friends worse than his enemies--from the ferocious chieftain Ibn Mayyah, who refuses to take prisoners during the siege of Awali, to his latest wife Najma, whose entrance into his harem sets off a firestorm of backbiting and violence. Tale's end finds Khureybit still riding high--backed by the British crown and seconded by Hamilton, now called Abdelsamad on his conversion to Islam--but he's become a paper tiger, an absurd figure whose power struggles with his old allies even within his family--fights he can't possibly lose, though they strip him of everything he once loved--grow increasingly farcical. Munif is no Euro-basher, as his sympathetic, incisive portrait of Hamilton, the most compelling of his characters, shows. All the more impressive, then, is his satirical review of a calamitous series of cultural exchanges that leaves his Arab potentate bloated with borrowed power and utterly without grace or dignity. -- Copyright ©1993, Kirkus Associates, LP. All rights reserved. --This text refers to the Hardcover edition. Full of Machiavellian intrigue and searing political satire, Variations on Night and Day, the final volume of Munif's landmark Cities of Salt trilogy, chronicles the creation of a Persian Gulf nation by a corrupt Arab monarch and conniving British empire builders. Original Language: Arabic --This text refers to the Hardcover edition.